I was 8 months pregnant when my husband and I separated. The baby I thought I’d never have was just 5 weeks from arriving, and the plan had been for me to be a stay-at-home mom. I didn’t see it coming. Plans change — that’s no surprise to anyone. And in that moment, almost every one of my plans changed. 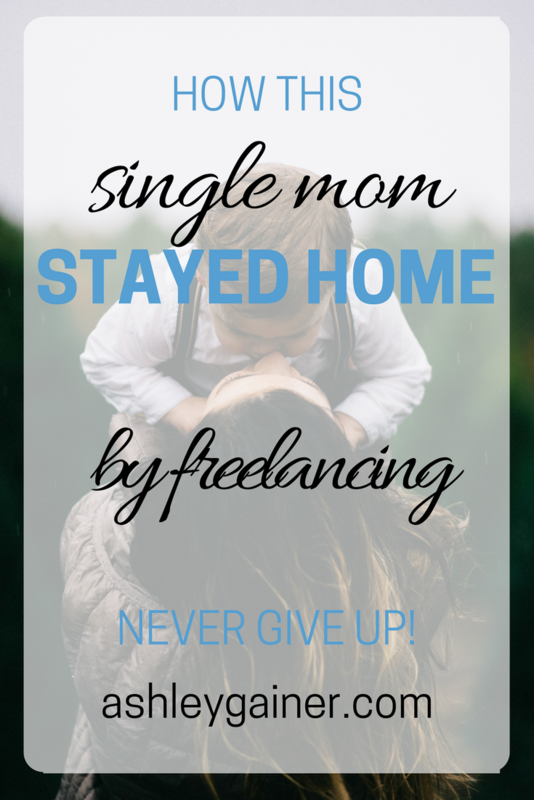 But I wasn’t willing to give up my commitment to being “Mama first,” and earner second. I wanted nothing more than I wanted to be home with my baby. Armed with fierce determination and what a friend called a “warrior spirit,” I spent several years figuring out how to make a living online as a freelance writer and editor, and I did it all around the daily demands of parenting an infant-to-toddler-to preschooler. There was some help along the way, but no regular childcare and no partner to provide a safety net, financial or otherwise. What resulted was a lot of mistakes, a lot of wasted time, and (no surprise) a lot of tears and sleepless nights. All those “I went from $0 to six figures in 6 months” entrepreneurs can eat my socks. They need a “results not typical” disclaimer on everything they do. Reality looks like this: Not knowing when or where the next client would show up. Not getting a haircut or buying any new clothes for myself for two years. Never setting foot inside a restaurant unless someone offered to take me/us there. Breaking down in tears when a friend’s dog chewed a hole in the toddler’s favorite stuffed animal and not wanting to spend the precious $8 on replacing it (and then getting out the needle and thread and sewing Cookie Monster back together as well as can be hoped). Stress hives when the 15-year-old vehicle needed hundreds of dollars in maintenance. My major turning point came after I found some good counsel, solid resources, a wildly supportive community of fellow freelancers (almost none of whom were parents), and just a bit of good luck. I crossed into the 5-figure range the next year, and in my third year of working from home we no longer lived below the poverty line. I’m not an overnight success story. 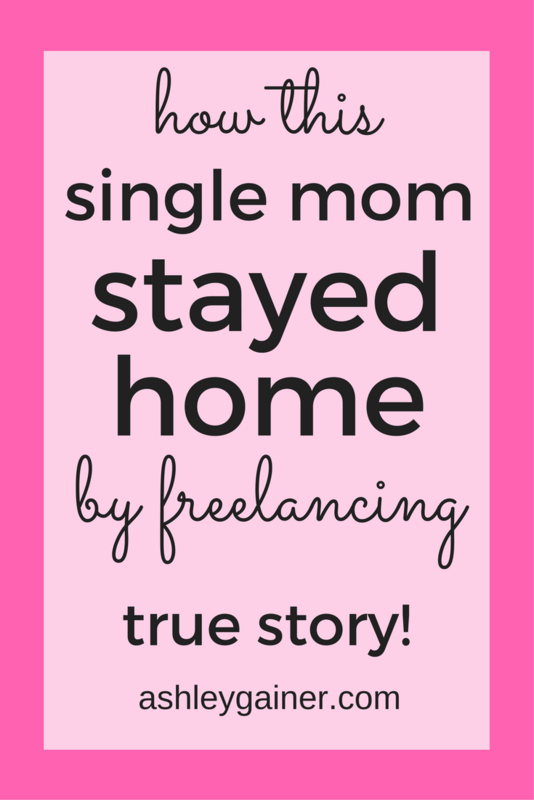 I wasn’t making bank in my first month of freelancing, or even after being several years in. I made a ton of mistakes… and not the little kind, like having the wrong layout on my homepage or not picking the perfect dream niche. More like the kind that kept my income painfully, dreadfully, stressfully low for way too long. I made all these mistakes for a really long time. And then, one day, I started paying close, deliberate attention. I began having conversations with women who had gone before me and were making the kind of money I wanted. I found a mentor and a community. Everything began to change, and it’s only been getting better. You won’t find income reports here. I don’t flash numbers around (my numbers aren’t all that flashy anyway). But I’ll tell you this: I work just 10-15 hours a week (about 70% of which is client work) and I consistently hit the $3,000 mark, sometimes more but rarely less. Blow-your-socks-off monthly stats? Jaw-dropping success? Swimming pools full of gold coins? Not hardly. But I make enough to cover the mortgage, health insurance for the family (which we buy ourselves), and even the utilities. I no longer lie awake at night worrying how I’m going to pay a bill or buy my son new shoes. My husband is freed up to do what he needs to do to grow his own business without having to resort to “scut work” just to make ends meet. The kids are healthy, the heat is on, and the fridge is full of food. Am I anywhere near six figures? Heck no, but I’ve got a preschooler, a toddler, and another one on the way, and I get to spend my days with them with very few worries. I’m the richest woman in Chapel Hill. Your path doesn’t need to be nearly as rocky as mine was. It also doesn’t have to be as low-paying as most work-from-home advice assumes. There’s a lot of advice out there for anyone who wants to work from home as a freelance writer. Start a blog, put a lot of time and energy into it, and eventually it will start giving you a bit of revenue. Sell this or that product and make money effortlessly just by talking on Facebook or Instagram about how great the product is. Write for free or for pennies per word, and eventually you’ll start getting better-paid writing opportunities. Sign up for a $2,000 program that will teach you how to set up someone else’s business model in a “niche market” using the presenter’s favorite programs and software that you buy through affiliate links (nevermind the fact that you don’t know the first thing about the target market or the skills you’ll need to pull it off in that timeframe). That advice works for some people — that’s why it exists — but often these tactics require a ton of time and effort to gain any traction and really start paying off… or they’re priced so far beyond your reach that you might as well be living on another planet. Here’s the truth: you can work from home and make good money, with much less ramp-up time, and without pouring in more hours or dollars than your family has to give. There are legitimate, authentic ways to use your skills and interests in a home-based business that brings in a decent side income without sucking up every spare moment, keeping you chained to the computer all hours of the night, and pulling you away from your kids. Being a writer for hire is how I made it work for me. If you think it might be how you can do it too, you’re in the right place. This takes work, careful planning, and a willingness to learn, but it can be done — and around your family’s needs. 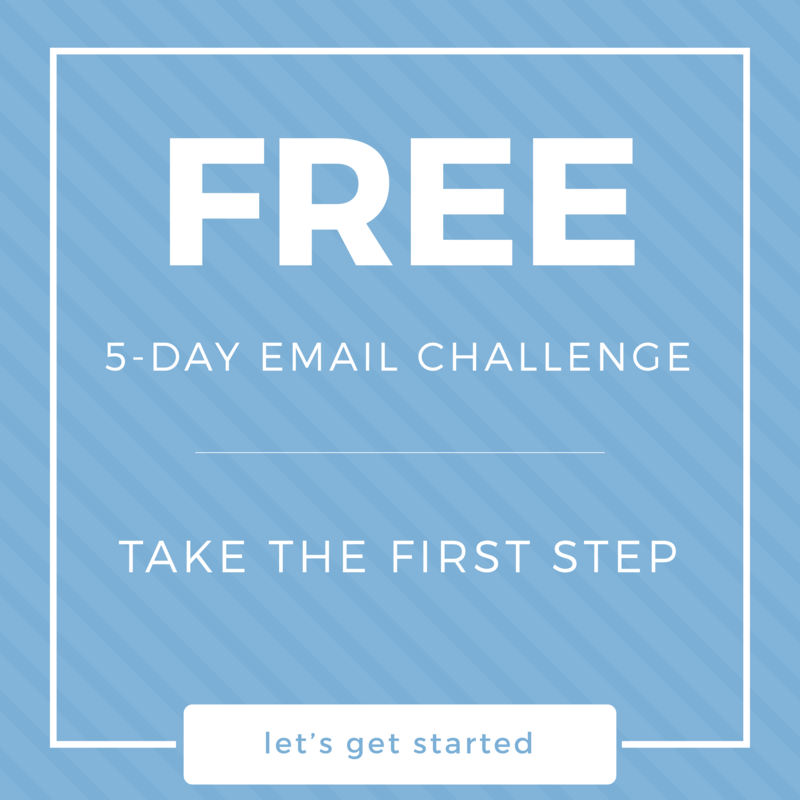 Whether you’ve already been working from home and you want to “level up” or you’re still trying to figure out how to get started, you can make this happen. This isn’t necessarily the path to millions, but you can bring in an extra $500, $1000, even $3000/month or more without sacrificing the home life you value so much. The more savvy you are, and the more targeted your efforts, the more quickly your work will pay off and the better your income will be. That’s a fact. It’s also my own experience. Lots of parents have been able to make their work-from-home dreams happen, and now it’s your turn. There’s no “one kind” of being a freelance writer, and there’s no cut-and-dry method for becoming successful… but that’s the exciting thing. You make your career what you want it to be — whether you’re a single parent, a stay-at-home mom (or dad), or you don’t have kids yet but want to be able to be at home in the future. No matter your starting point or your progress thus far, it helps to have some guidance along the way. That’s exactly what this website is all about. Here you’ll find articles, training, coursework, and other resources to give you the knowledge you need to start well and grow quickly. I’m your coach, your guide, and your cheerleader. 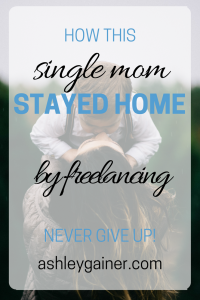 No matter what, as a mama with a deliberate, high-reaching approach, you won’t necessarily look like the majority of people you’ll bump into online (who are child-free, who have outside jobs, who are already making their millions online effortlessly, or who are slugging it out with $3 digital downloads and endless Facebook parties). You aren’t alone and it’s still possible. Join my Facebook conversation here and become a part of a growing community of like-minded parents who want to bring in serious money without making serious sacrifices in the most important arena: your role as a primary parent. This is Farzana from Bangladesh. My story is almost same as yours. Only difference is I was 4 months pregnant when me and my child’s father separated. 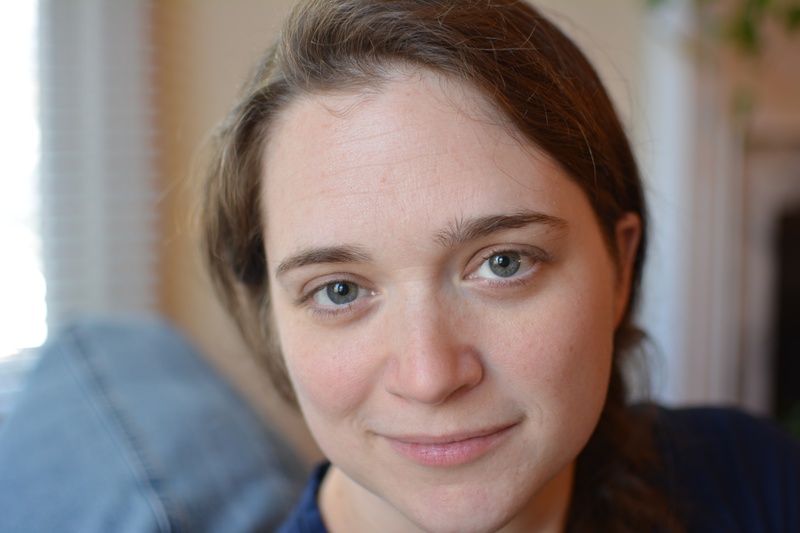 I was pressurized by my ex husband to abort my unborn baby but i did not listen to him. Now my baby is of 7 months old and I am looking for freelance job opportunities. I just love writing but I do not have prior experience of working as freelance writer. Do you have any opportunity for me at your business? Waiting in anticipation to hear from you. Hey, Farzana — I’m so sorry you’re in such a bind! Send me a direct email (ashley at ashleygainer.com) and let’s talk some more.